The popular saying celebrating the importance of agriculture, “No Farms, No Food,” could easily shift to “No Bees, No Food” if solutions to the honeybee decline are not found. Which is why Troy Anderson, Virginia Tech insect toxicologist, is making inroads toward understanding why the honeybee — the most widely managed crop pollinator — is disappearing in droves. 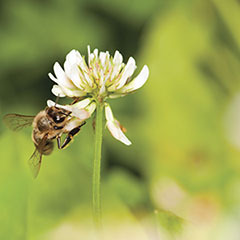 While pesticides have been implicated in the reduced number of bee colonies available for crop pollination services, several gaps remain in the knowledge about pesticide exposures and the health status of bees in order to understand the decimation of these pollinators. Anderson’s team uses a multidisciplinary approach to study bee decline, including pesticide residue analysis, nutrition and immune physiology, and population dynamics modeling. This entry was posted in Agriculture and tagged 2014 report, pest management, research. Bookmark the permalink.